Greetings from Las Vegas! This week I'm in Las Vegas making my yearly pilgrimage to Coverings 2014, an annual tile trade show. Avente Tile Owner, Bill Buyok, in front of the Cuban Heritage Tile Mural at the Tropicana. As I conclude my final post on playing with pattern in tile design, I'm excited to share a unique wall installation of our classic, popular Cuban tiles and our newest line of cement tile offered by Aguayo Cement Tile. 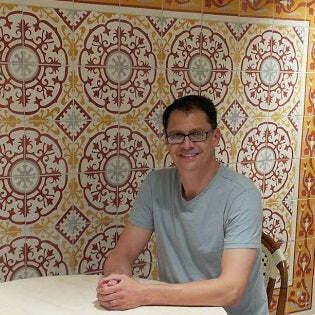 That's yours truly seated at a wall installation of our popular Cuban Heritage Design 140 1A 8" x 8" Handmade Cement Tile at the Tropicana Hotel & Casino in Las Vegas. Avente Tile supplied this unique installation when the resort completed a remodel a few years ago. 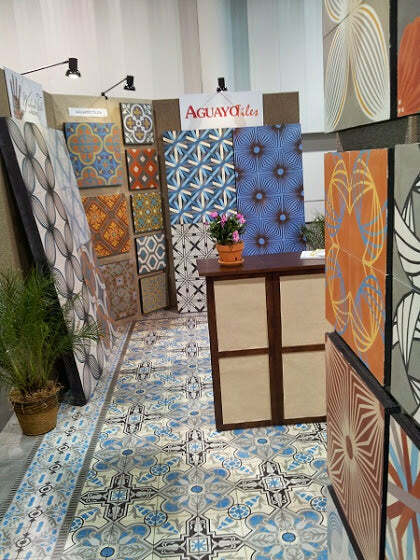 Guillermo and Tania is the sixth collection of unique cement tiles offered by Aguayo Cement Tiles that are created by artists from the Dominican Republic. 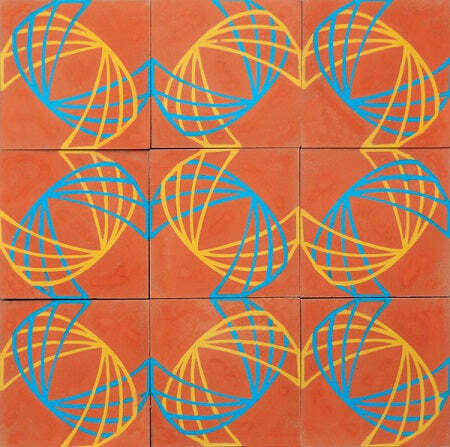 These unique tiles showcase the artist's skills and elevate cement tile to functional art. This collection, created by artists Guillermo Gomez Lama and Tania Marmolejo, features eight different designs - each presented in three colorways. All tiles are in the 10-inch square format. The collection features new, contemporary designs that are ideal for commercial and residential spaces. 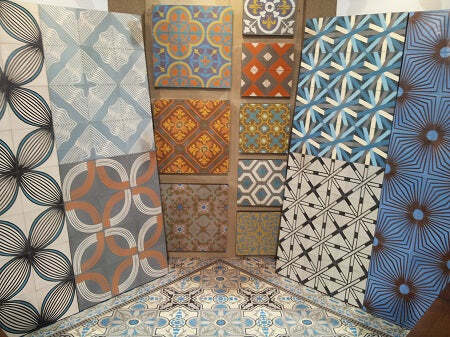 Guillermo & Tania Collection is a new cement tile line from Avente. One of may favorite new patterns from Guillermo is "Asterisk" in a bold blue colorway. Lama is a visual artist, graphic designer, paper lover and obsessed with both patterns and the production process. His work's influences are based on vibration and repetitions of experimental electronic music, mosaics, and the patterns of human behavior. His work is also influenced by the art of lithography and giants in that field, such as Andy Warhol and Peter Gee. The influence of Lama's graphic design background and lithography are apparent in this cement tile pattern. Also, I love the flowing, organic patterns of Tania, and a personal favorite is Bloom. The motif creates a three-dimensional effect as the petals converge on each bloom. For this project, Tania uses the line as a design element. She uses an eclectic mix of Swedish textile designs and Caribbean themes, such as tropical gardens and the sea. 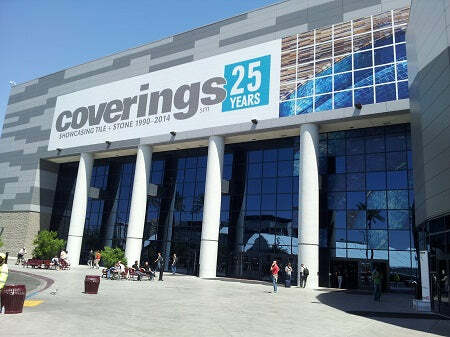 I'm looking forward to the show and celebrating 25 years of Coverings. I've been attending the show for over a decade. If you happen to be at the show, stop by Booth #19002 and say hello! You'll love the new patterns; but, you'll also be able to see some of our classic patterns that are as popular today as they were when Aguayo first introduced them over a decade ago. We'll also be sharing more of the Guillermo and Tania collection here, and it will soon be available for purchase at Avente Tile. I must begin this post by saying, thanks! Thanks to a very smart, extremely motivated, and very inspiring entrepreneur, Sally Kane! We just happened to meet because she called to talk about cement tile for her new restaurant, The Coronet, in Tucson, Arizona. 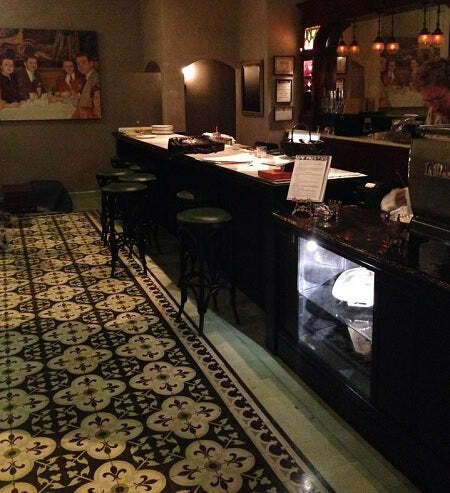 The Coronet is a brasserie style restaurant featuring Old World cuisine and cement tile! Now, Sally is one of those people who has passion and takes ownership of every part of her project. 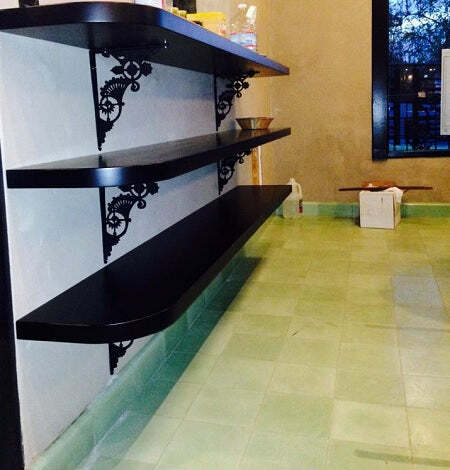 She's good at what she does; from color choice and tile design, to finding just the right plates and chairs for her bistro, to hiring the right team. She has every detail down. And, we haven't even started talking about the menu. 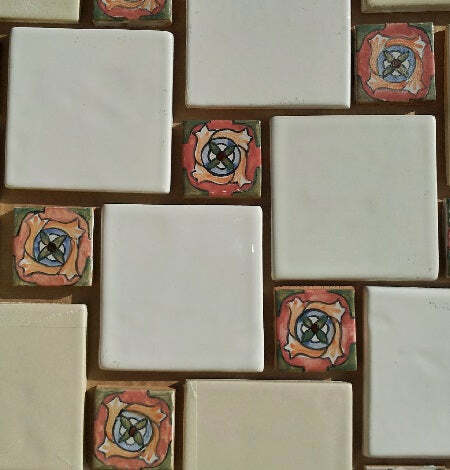 It was almost a year ago she called to order the Heritage Solid Color Chip Set for her cement tile project. Soon after the color chips arrived, she had decided on the palette: a mix of lovely greens on a classic pattern and border also boldly applied to a geometric pattern. She had "done up" some full size renderings using crayons in the closest match to the color chips. She wanted to know what I thought. Sally mentioned she had this painting that would be the focal point of the main dining room and the tile pattern and colors should draw you to the painting; but, not take your attention away. 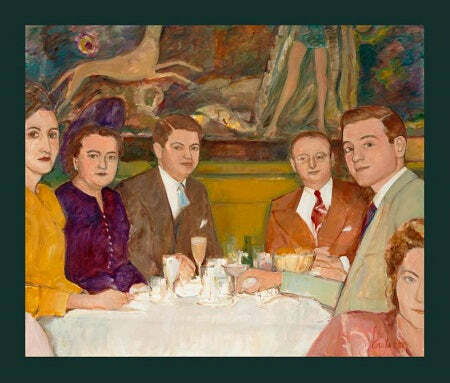 The painting, El Morocco, is by Jerome Carlin and depicts a well-healed family having dinner in a nice restaurant. El Morocco by Jerome Carlin is a focal point in the main dining room of The Coronet. I questioned, “What type of restaurant is this going to be? What type of food, style, and ambiance do you want to convey?” Sally replied, “It will be a French-style bistro. But, don’t box me in. It will honor that style but not slavishly follow the tradition!" I could see it all working together now. The Traditional French floor tile in cool Misty Jade with hints of bold Peapod set against a complex Pearl Grey and defining Jet Black. Yes, the pattern was honoring the style in a new and fresh way. The colors and pattern added to the main dining room's focal point -- the painting. I remember being very impressed with Sally's effortless ability to have all the details of the design working together. After she placed the order for this commercial installation, I asked if she wanted to see strike-off samples before proceeding with the full order. Feeling confident with her design, she didn't even bat an eye when she replied, "No." She patiently awaited her tiles, which arrived with some damage from the carrier and incorrect trim. We worked to resolve the problems, while Sally patiently allowed us the time to correct her order! 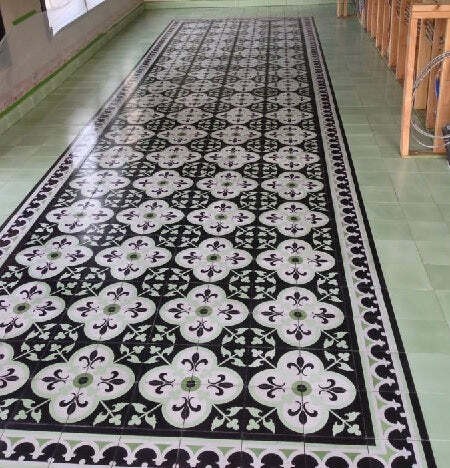 The Traditional Fleur-de-Lis quarter cement tile pattern with Macoris Border tile. 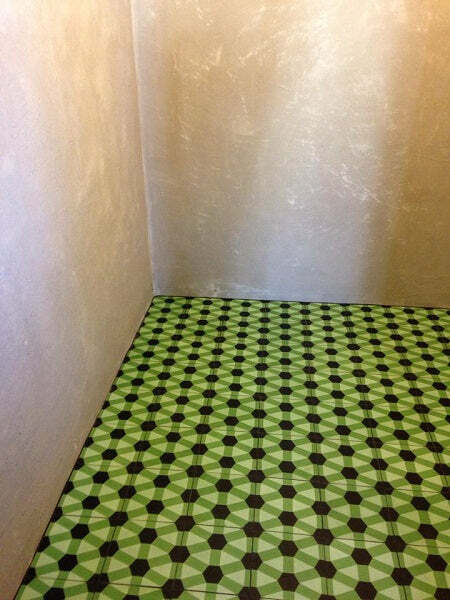 A Geometric Diamond cement tile pattern was the choice for the bathrooms. Sally was kind of enough to keep me updated with the progress of the work through The Coronet's Facebook Page. I loved seeing the thought that went into the layout, installations, and progress. The Fleur-de-Lis and Macoris Border in a dry layout. Sally Kane inspecting the installation. 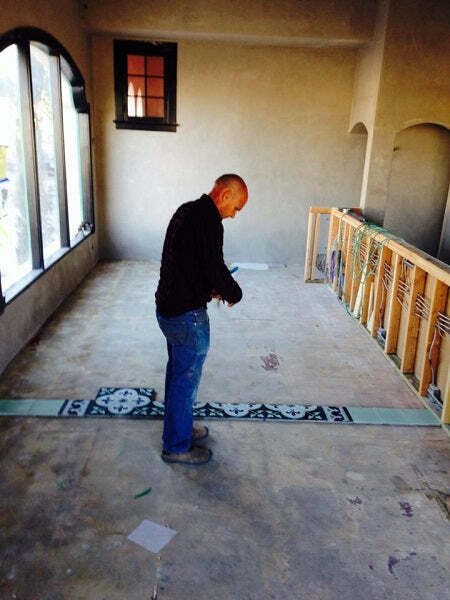 The Cement tile carpet install is complete! And, the progress with the bathrooms and concrete sink. Notice the texture on the Venetian Plaster walls. A bold geometric pattern for the lavatory was selected. 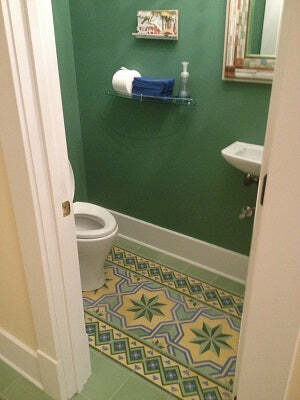 The pattern used in the lavatory is Avente's Traditional Diamond handmade cement tile. Finally, one of my favorite effects is the use of plain tile throughout the restaurant. 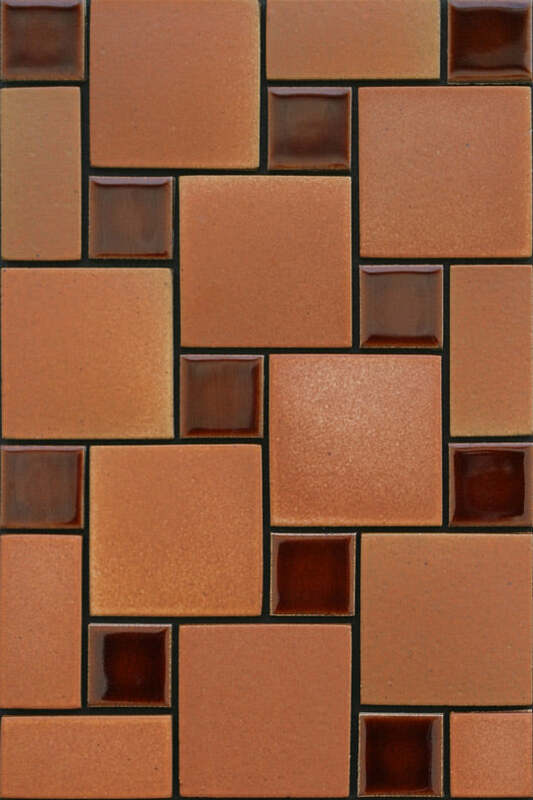 The subtle variation in tone creates a sophisticated, Old World charm that you just don't find in manufactured tile. Here's a great shot that showcases the color variation. Plain cement tile creates visual interest with their natural color variation. Well, there is so much more I could share about this amazing woman and the stunning space she has created. All I've done is talk about the tile! The food is already getting great reviews and if you find yourself in Tucson, Arizona, please stop by The Coronet. Sally says, "The Coronet is a brasserie style restaurant with Old World rustic cuisine and a cute, yet full, bar." You are sure to find quiet music, a big patio, good shade, outstanding coffee, and some stunning cement tile! All of us at Avente Tile wish you much success, Sally Kane! The pinwheel pattern is a popular and versatile tile layout that adds great visual interest by integrating solid color with decorative tiles into a timeless design. Here's a great example of a pinwheel tile pattern that pairs glazed ceramic dots with large ceramic tiles in a matte finish. A pinwheel pattern with Yucatan Glazes in striking gloss and matte finishes. 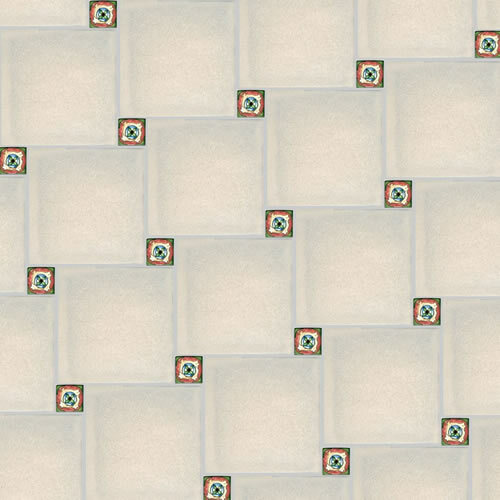 You can create a pinwheel pattern using only plain, solid color field tile. 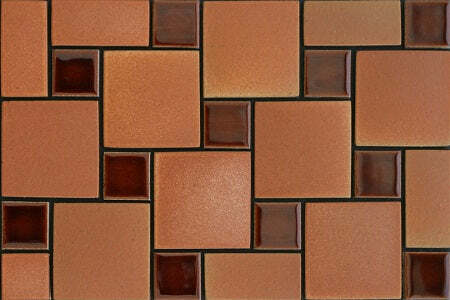 In the example above, tiles in similar colors are set-off by contrasting matte and gloss glazes. You can also add brightly glazed tiles with neutral colors to add a punch of color. If you're hesitant of using too much color in the pattern, then consider randomly alternating the brighter colors dots with dots in the same glaze as the larger tile, as seen in the example below. Brightly colored glazed tiles can be randomly added to add interest to the design. Or, you could choose to incorporate decorative tile with plain field tile, as seen in the two concepts show below. Decorative 1" ceramic tiles, referred to as dots, can be paired with 4" plain white tile. Decorative 1" ceramic tile dots are paired here with 4" plain blue tile. The pinwheel pattern is created by combining two different tile formats, usually with squares of different sizes. 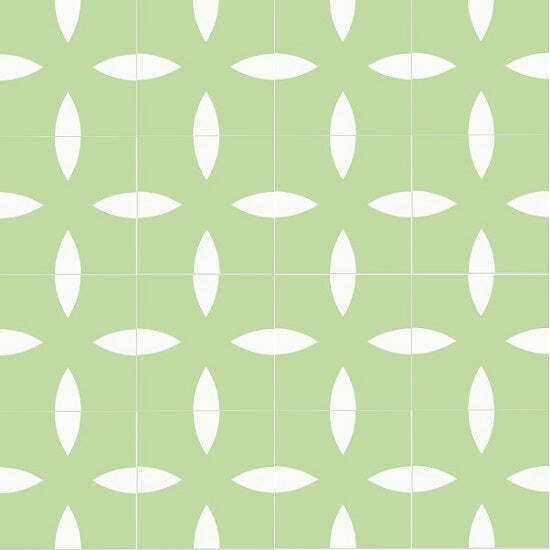 A pinwheel pattern for tile often uses different sizes of square tile. But, you can also create a pinwheel using tiles in different formats, such as squares and rectangles. 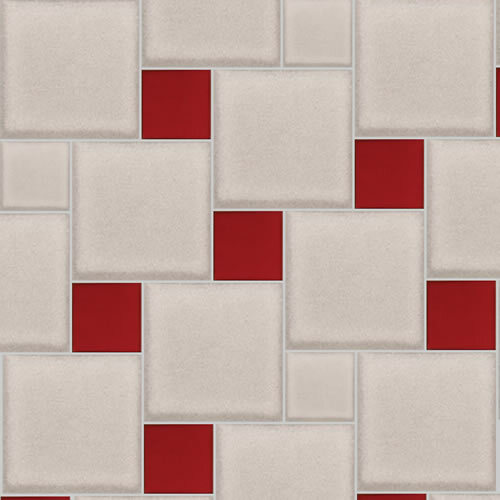 A Pinwheel Pattern for tile can use both square and rectangular formats. When using square formats, you can use two squares that are relatively close in size. The pinwheel pattern is a common tile layout. Or, you can use squares that are distinctly different in size. Small "dot" tiles can be used with larger format tile to create a pinwheel. The pinwheel pattern works equally well on floor installations as it does for a backsplash or wall. In this installation, Mission Red Rustic Pavers in different formats are paired with glazed field tile. This random pattern draws its design inspiration from the classic pinwheel pattern. This random pattern draws its inspiration from the pinwheel pattern. If you aren't using a standard layout where we provide the ratio of tiles required, or you find yourself with uncommon tile sizes, then you'll need to calculate the tiles required by finding the ratio of small tiles to larger tiles using the exact area of each tile. So, measure the tiles and get out the calculator, then follow these easy steps. Find the exact square inches of each tile to get an accurate amount. Do NOT use the tile's nominal dimensions. 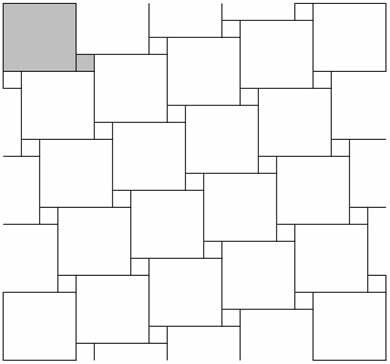 Find the area of the large tile in inches. 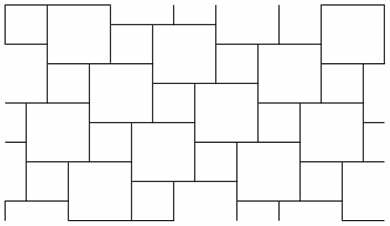 Find the area of the smaller tile in inches. 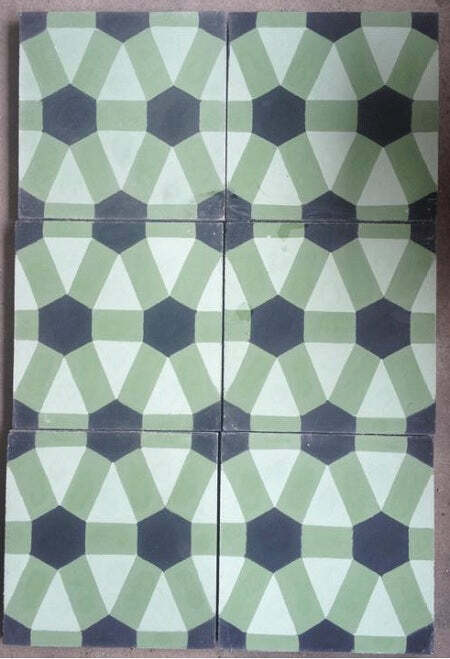 Divide the the area of the smaller tile by the larger tile. The ratio can be used to determine the number of smaller and larger tiles required for any job. Say the exact dimensions of the larger tile are 12"x12"; the smaller tile dimensions are 4"x4". For a tile job that requires coverage of 100 sq. ft., you'll need 11.11 sq. ft. of 4"x4" and 88.89 sq. ft.of the larger format tile. Remember that tile is sold in nominal sizes. A 12"x12" tile might be as small as 11-5/8" or as big as 12-1/2". Nominal means "about." Read more about nominal tiles sizes on our website. The percentages shown are based on a full layout with no cuts. Actual percentages will vary depending on the area to be tiled and the layout. Perform a dry layout before you start. 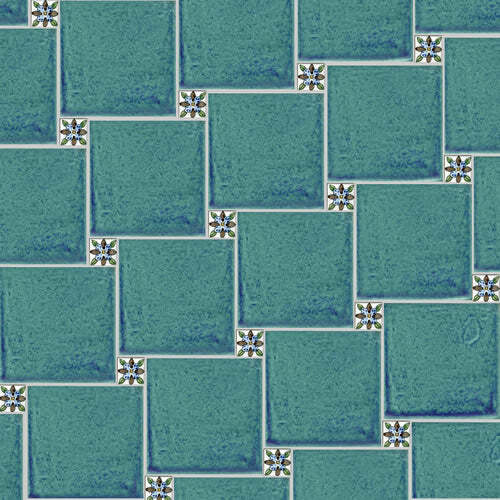 Layout the tiles in the pinwheel pattern using the grout width you desire. When you do this before installing, you will be able to pinpoint problems. Remember, with any layout, you want to avoid small cuts, cuts on small tile, and cuts by doorways on flooring tile. You will minimize waste, save time and avoid problems with a dry layout. This dry layout features our Spanish Andalucia ceramic tile dots and Yucatan ceramic tile in Milkweed 4"x4". To see more tile layout patterns besides the pinwheel pattern discussed here, see our post on Rustic Cement Tile Paver Patterns. To learn more about tile patterns, see my previous posts on Tile Tips for the Pattern Addict and Tile Tips for the Pattern Shy. You'll be a pattern pro! 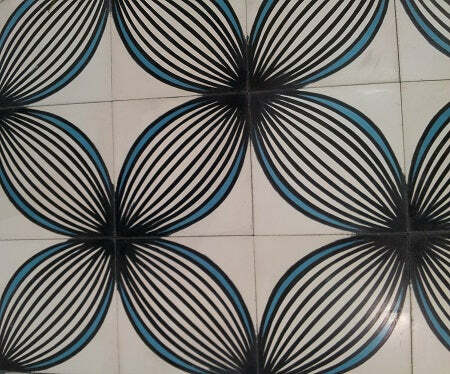 This recent cement tile installation features a centered pattern so the eye is naturally drawn to the main field pattern. Gone are the days of solely mixing bold colors and patterns only to walk away with a headache rather than inspiration! However, integrating patterns to create a soothing space remains high on everyone.s design list. With "staycations" on the rise, people crave to be enveloped in serene, soothing environments without leaving home. Such was the case with one of our clients who created a very different effect with the Mission Ring Cement Tile pattern on their kitchen's backsplash by using the same color in almost all of the cement tile mold segments. The green of the Mission Verde Caribe color was the perfect choice for this kitchen located in Hawaii. The white in the tile accentuates the white of the cabinets, while the effect of the wood tones reinforces the tropical, peaceful feel. Thanks to our customization services, not only can you substitute colors to create a unique effect; you can also alter a pattern by using the same color in an adjoining pattern (or mold) segments. 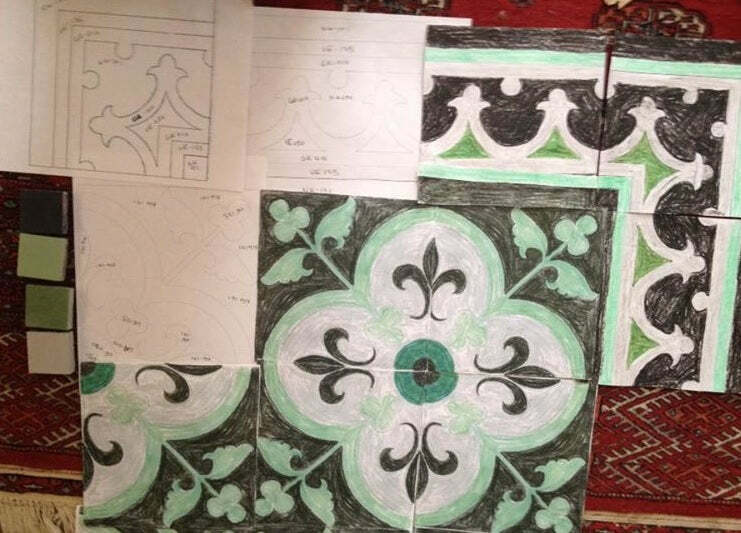 Designing with cement tile means taking a vision, idea or surrounding complementary area, and making it come to life! To learn more about tile, patterns, and design, make sure to subscribe to Avente Tile Talk. Our blog is published weekly and this month, we'll continue to examine patterns by focusing on herringbone, diamond, and on-point and more. Join us! 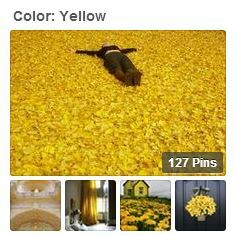 What better color is there than yellow to brighten up an area that lacks something. From an accent wall, to a wall niche, and of course tile, spaces that include yellow are associated with happiness, intellect, and energy. Yellow is also closely related to Spring and Easter, where, according to color experts, both the color and the seasonal change produce a warming effect, arouse cheerfulness, and stimulate mental activity. 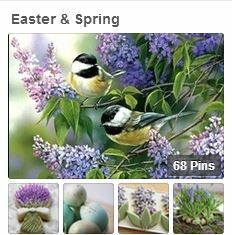 With this month.s Pinboard selections, we know you.ll soon be focusing on the fresh and colorful changes that only come around this time of the year! Inspired? Then visit our pages on houzz.com, our boards on Pinterest, and browse through dozens of our Cement Tile Design Ideas andCeramic Tile Design Ideas where you can find a large collection of projects showcasing our handmade and hand-painted ceramic tile, cement tile, decorative tile, mosaic tile, and so much more. Let us know how we at Avente Tile can assist you! The month of March was devoted to tile patterns and designs. I've had so much fun and such a great response, I've decided to continue playing with pattern through April! 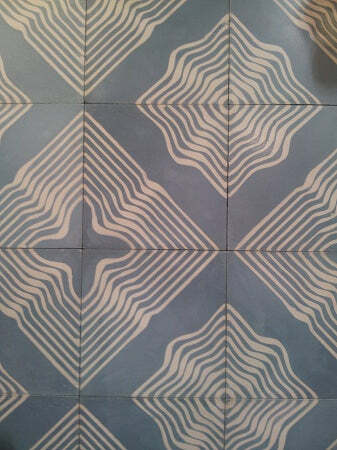 I'm no April Fool, when I say we've got some more great tile talk on pattern. Last week, I provided some design tips on how to effectively use patterns if you are pattern shy or a pattern wallflower. Today, I share my favorite cement tile tips for the pattern addict. If you're a pattern addict, keep these tips in mind to maintain balance and harmony in the space. Too much of a good pattern can create chaos. The scale of the pattern needs to match the scale of the space or the room. Large-scale patterns are striking in large open rooms. A quarter design pattern and border separated by plain tile makes this tropical veranda inviting and expansive. Large patterns often need a larger space, such as this veranda. But, smaller rooms require smaller patterns. For instance, quarter design cement tile patterns are too big for many kitchen backsplashes; you'll need to use a pattern that fits on a single tile. The scale of this pattern fits nicely into this cozy New York City apartment's kitchen. The scale of the pattern should match the space. Unify different patterns in a room by choosing a common color for all patterns. Or, use the same pattern in different scales or colors. The border pattern and main field pattern in this entry are flawless together! Why? The patterns are unified by common colors. Unify patterns in different rooms by choosing common colors. 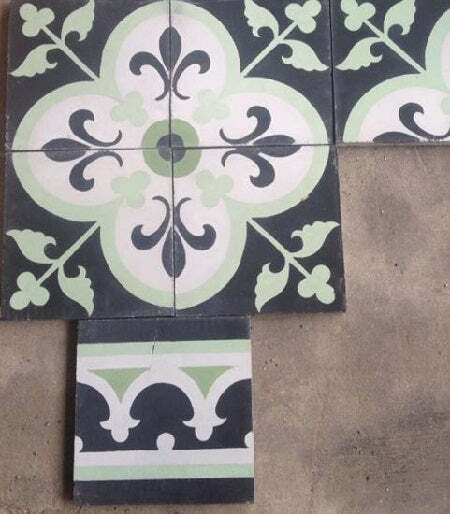 One of the most common questions I get with cement tile is, "What border tile works with this pattern?" 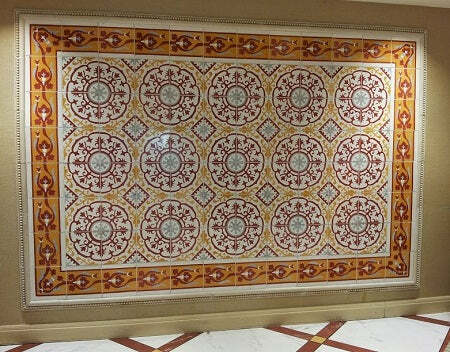 The answer is almost any border tile pattern can work with that pattern if they are unified by color. In this installation, both the entry and adjoining powder room use cement field (solid colored) tiles and border patterns in the same color. Use the same colors in patterns to unify patterns in the same room. The colors really unify both spaces and allow for a cohesive design. It's a lot of pattern in two small spaces. However, you can see that when it's done right it works splendidly - even the pattern shy will agree! Limit yourself to just a few patterns in a single room. Or, you can use subtle or muted patterns to help create some negative space. This typically bold, Cuban pattern (below) was muted to create a much softer effect that was used in the entry, bath, and dinning room. Cuban Heritage Design 150 in a muted color palette. The muted pattern allows you to use more of the same pattern and provided much needed negative space. Here's the pattern on the entry floor. 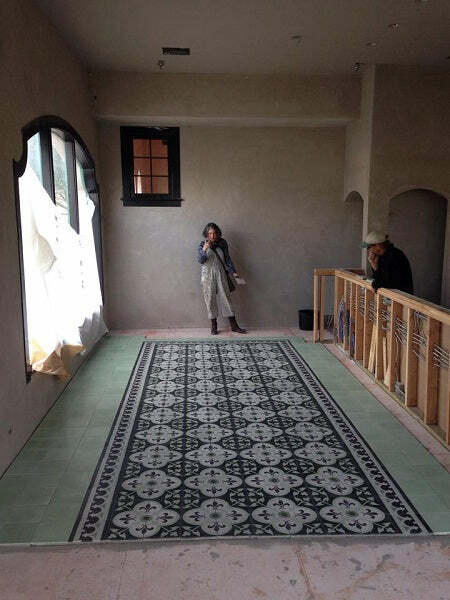 Muted Cuban cement tile pattern in the entry. 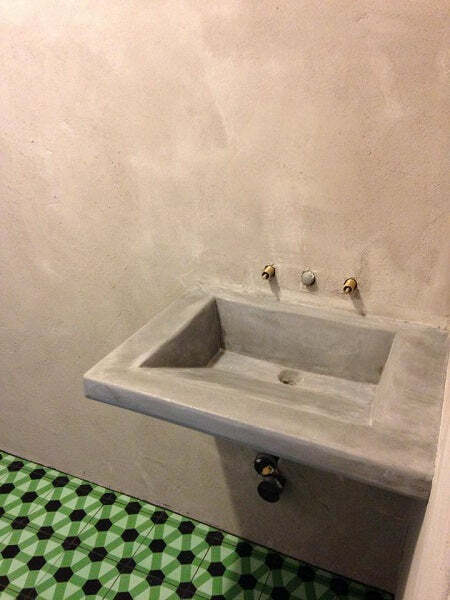 Muted Cuban cement tile pattern in the powder room. Notice how even the muted pattern becomes powerful in the bathroom? This is because there is very little negative space with the pattern on the floor and wainscot. Contrast this to the dining room where the cement tile is only used as wainscot. Muted Cuban cement tile pattern is used as wainscot in the dining room. In fact, let's step further back to get a really good view of the entire dining room. Negative space between different patterns is required. What do you see? Did you notice a different pattern and some negative space between them? The wainscot and the fabric in the chairs use different patterns; but, the rest of the room is "pattern quiet." Patterns need room to breath and negative space and the right color are the perfect dance partner. When using several patterns in a room, distribute them around the room so there is space between them to balance them out. However, if you want to draw attention to an area or wall, such as a kitchen backsplash, then concentrate the pattern to create a focal point. 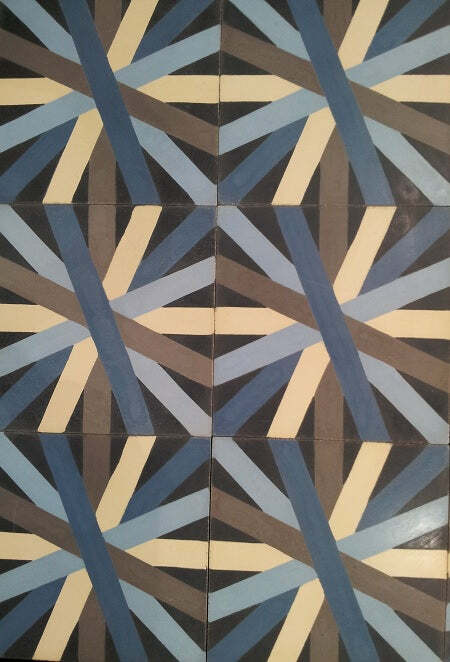 To learn more about tile and pattern design, make sure to subscribe to our blog. It's published weekly, and this month, we'll continue playing with pattern.